Every artist needs to have that certain something to set them apart. It plagues the rock scene; bands becoming indecipherable due to so many similarities. Firewind’s X factor has always been their lead guitarist, Gus G. Having also played alongside Arch Enemy, known for their incredible guitar hooks, and Ozzy Osbourne, known for being Ozzy Osbourne, Gus’s dayjob in Firewind gives the metal band that essence that elevates them above many of their contemporaries. 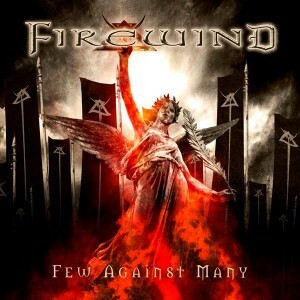 It’s hard to believe, but ‘Few Against Many’ is Firewind’s 7th album. For better or for worse, much of the new album is business as usual. An appropriately ominous march begins opener ‘Wall of Sound’ before launching into an old-school metal riff, complete with Killswitch-esque harmonics and obligatory double bass pounding. Apollo’s raspy vocals sound like something dragged right out of the 80s speed metal scene and compliment Gus’s stellar performance. The title track best exemplifies the classic influences on ‘Few Against Many.’ The power metal chorus combined with Gus’s fret wankery arms Firewind with a sound unlike anyone else in their scene, or indeed anyone else in this decade. Looking at any tracklisting and coming across “feat. Apocalyptica” is a surefire giveaway that there will be a powerballad that Meat Loaf would be proud of. To give Firewind their dues, even without their most powerful asset performing on parts of the song, ‘Edge of a Dream’ is still a hell of a track; a welcome breather amongst the thrash influences. Sure enough, the pace picks back up for the remainder of the album. As is tradition, closing track ‘No Heroes, No Sinners’ is epic in a different way – lots of reminders that the band and the listener are in this fight, whatever that fight is, together. ‘Few Against Many’ is a cocksure metal album. It breaks no boundaries within the genre, nor even within Firewind’s catalogue, but if you fancy ten tracks of 80s inspired heaviness, you could do a lot worse. Not to mention, there is ample opportunity for air guitaring thanks to one of the best metal guitarists on the scene today.